The Living Wallet is a sweet little gadget that can help all of us get our spending under control. 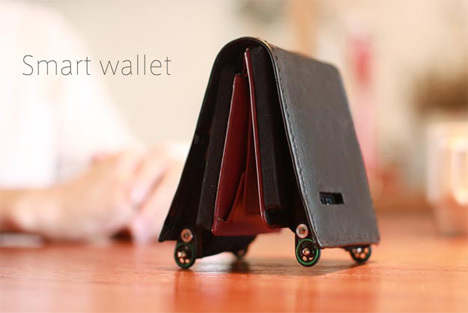 The smart wallet is linked to your iPhone and a bookkeeping app called Zaim. When your financial situation is unfavorable and you have no business spending money, the wallet runs away from your grasping hands. If you ignore that warning and catch it, the wallet will yell for help and tell you to put it down. But if those evasive measures don’t work, the app pulls out a really dirty move: it calls your mom to tell on you. On the other hand, when your financial situation allows you to spend a little more money, the wallet actually encourages you to make purchases. In fact, it kind of entices you to spend. It plays classical music, worms its way over to you and speaks out the names of Amazon products. Maybe it’s not the best money-saving plan, but it sure is adorable. No word on if this is being produced for purchase or if it’s just a novelty idea meant to entertain. See more in Robotics or under Technology. October, 2013.